There is a really surprising fact about centroids, one I had not known about until this year. The area of a triangle is equal to 1.5 times the distance of centroid to a side times the length of the side. It is not too hard to prove this result. As I showed before, the area of a triangle is 0.5 (a*d - b*c) where u = (a, b) and v = (c, d) are two vectors that are the triangle's sides. 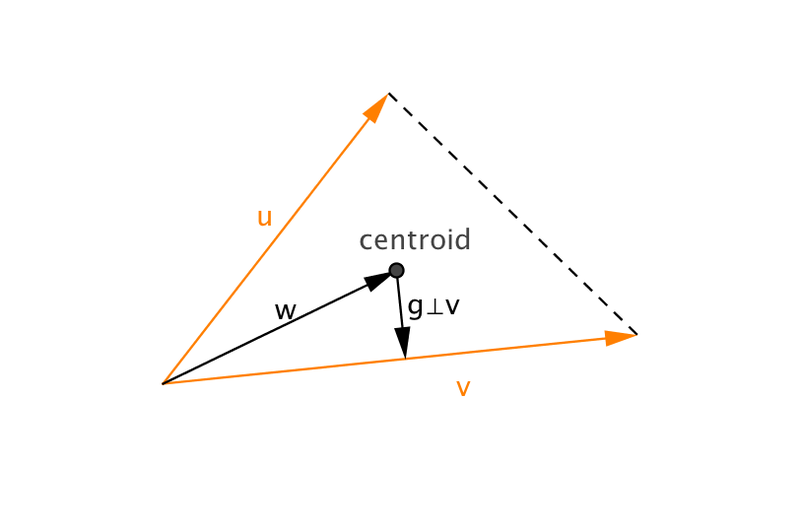 To prove the really surprising fact about the centroid, all that must be shown is that 1.5·g⊥v·v=0.5·ad-bc. The vector v is the side, so we need its magnitude; the perpendicular vector is adjusted by the scale factor g so that it is the proper distance from the side v to the centroid.